DSEA implements the latest technologies in providing clients with thorough communication and documentation, which is mandatory for a smooth, well-coordinated project. Each of our architectural team members are thoroughly experienced in 3D modeling and are highly technically-oriented. Every project, no matter how small, is modeled as this enables us to focus our attention on the details, where every perspective is considered. Douglas Ely is the owner and founder of DSE architecture, Inc. (DSEA), which was established in January 1999. Mr. Ely has over thirty-five years of experience in architectural design, needs analysis, historic preservation, 3D modeling, quality assurance review and construction project management, while developing a reputation for excellence and attention to detail. The consistently high degree of personal service provided by DSEA has created a special rapport between the firm and clients. Mr. Ely’s experience consists of a wide variety of project types including child care facilities, historic preservation, retail facilities, educational, commercial office, institutional, police facilities, high and low density residential, and custom residential projects. Our projects have been recognized with design awards and excellence in architectural design. Mr. Ely is a Southern California native and makes his home in Old Towne Orange. He received his Bachelor of Arts in Architecture from California Polytechnic State University, San Luis Obispo in 1981 where he graduated with the award for the top senior for service, leadership, and attitude. Mr. Ely has been licensed as an architect in the State of California since 1984. Tom Aldrich has over six years of architectural experience on projects ranging from healthcare design, residential projects, and educational projects to commercial retail, restaurant and office projects. Prior to entering the architecture profession Tom worked for over nine years in the construction industry. He worked on several large-scale projects including the CHOC south tower expansion in Orange. This unique mixture of knowledge and construction experience allows Tom to thoroughly understand what it takes to deliver projects from concept to completion. Born into a family of artists and musicians, Tom began his education at the Arts Students League of New York before joining the Army and serving four years all around the world with the 82nd Airborne Division. He served our country in the Philippines, Iraq & Afghanistan. After his term in the military, Tom continued his education after moving to California and completed his Bachelor’s of Architecture degree at NewSchool of Architecture and Design in 2015. Tom’s field experience has allowed him to become an expert in BIM Technology and 3D modeling. He is currently completing the required testing for his architecture license. By the time she was ten, Megan Kelly decided she wanted to go into the field of Architecture. With that dream she went on to earn her Bachelor of Architecture from the University of Southern California. While attending school she was a part of Alpha Chi Omega, the USC Auto Club and had studied abroad in Italy for a semester. She also earned a minor from the Marshall School of Business in Business Law in 2015. She has since been working in the field of architecture beginning as an intern to architectural designer and job captain. She has been working in the field of BIM Technology for over three years and is developing her skills as a 3D modeler. Her projects range from residential to commercial, restaurants and retail. Currently she is undergoing testing for her architecture license. Joel Freeson Carico is a consultant with DSEA, and is a licensed architect in the State of California. He has over 35 years of experience in the planning, design, construction documentation and construction administration of a large variety of project types including educational, commercial, residential, military, and historic restoration and renovation. Mr. Carico is a senior level CAD documentation expert and a Building Information Modeling specialist. 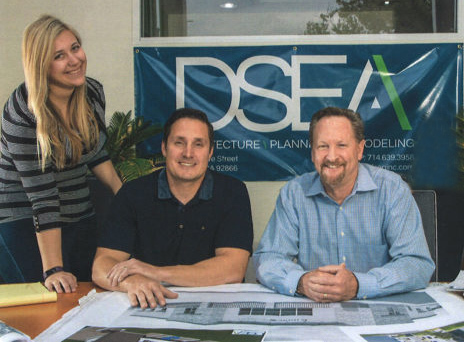 Joel consults with DSEA and provides high end architectural support as needed. He received an A.A. from Los Angeles Pierce Community College and a Bachelors of Architecture from California State Polytechnic University, San Luis Obispo.